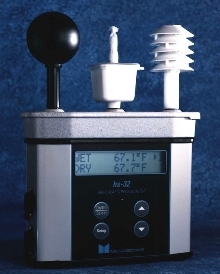 Model hs-32 WBGT area heat stress monitor measures humidity, temperature, and radiant heat conditions that can cause heat stroke and likewise heat-induced illnesses. With on-board humidity sensor, hs-32 displays relative humidity and calculates Heat Index or Humidex. Other features include covered wet bulb reservoir, shielded dry bulb, removable sensors, and 2 or 6 in. globe. Set-up options include degrees degrees C or F and multilingual display. Oconomowoc, Wisconsin (March 1, 2002) -- Metrosonics announced today the release of a new WBGT Area Heat Stress Monitor. The hs-32 is a general purpose area heat stress monitor ideal for measuring the high humidity, temperature and radiant heat conditions that can cause heat stroke and other heat-induced illnesses. Rugged and easy-to-use, the hs-32 provides quick and accurate WBGT measurements. With an on-board humidity sensor, the hs-32 also displays relative humidity and calculates the Heat Index or Humidex. Other features include; covered wet bulb reservoir, shielded dry bulb, removable sensors for remote applications, optional head, torso, ankle sensor kit, choice of 2" or 6" globe, long battery life from single 9 volt battery and a NiMH rechargeable battery option. Set-up options also include degrees °C or °F and a multilingual display offers English, Spanish, French, German and Italian languages. With the most rugged case design in the industry, the hs-32 can be conveniently hand-held or fixed-mounted to suit a variety of industrial, environmental and meteorological applications. Metrosonics expertise is the measurement, analysis and reporting of air quality, noise, heat stress and toxic/combustible gases in the workplace. Metrosonics is committed to providing "Guaranteed Simple Solutions at an Affordable Price" without compromising quality. For additional information on Metrosonics products, call 1-800-245-0779 within the U.S., 1-262-567-9157 outside the U.S., or visit the Metrosonics website at www.metrosonics.com.